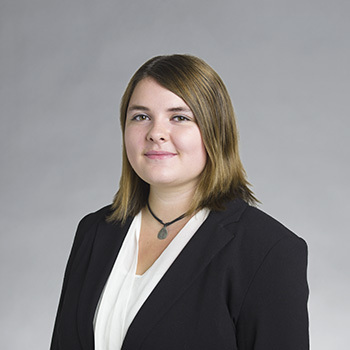 Kayla joined Auerbach Pollock Friedlander after completing her Bachelor of Architecture degree from Carnegie Mellon University and is working in the firm’s San Francisco office as a technical designer. In this role, she provides support to the studio team utilizing her training in architecture, theatre and sound design and her exceptional proficiency with computer aided design programs. Before joining Auerbach Pollock Friedlander, Kayla interned with architecture firms in Pittsburgh and New York where she participated in all aspects of the design and construction process including reviewing drawings, performing building code analysis, creating site analysis diagrams, evaluating the results of feasibility studies and providing construction administration support. During her education at Carnegie Mellon University, she had the opportunity to study abroad in New Zealand and Switzerland and participated in an Advanced Architecture Studio in France. Her Thesis, “Aberrant: The Psychoacoustics of Sonic Space” focused on sound design in architecture and explores how room acoustics play an important role in a person’s movement through space.